Jaws: The Revenge is a 1987 American horror thriller film produced and directed by Joseph Sargent, and starring Lorraine Gary, Lance Guest, Mario Van Peebles and Michael Caine. It is the third sequel to Steven Spielberg's Jaws, and the fourth and final installment in the Jaws franchise. It was the final theatrical film to be directed by Sargent. The film focuses on a now-widowed Ellen Brody (Lorraine Gary) and her conviction that a great white shark is seeking revenge on her family, particularly when it kills her son and follows her to the Bahamas. Jaws: The Revenge was shot on location in New England and in the Bahamas, and completed on the Universal lot. Like the first two films, Martha's Vineyard was the location of the fictional Amity Island for the opening scenes. Jaws: The Revenge received negative reviews from film critics. While production of the other three films in the series took around two years for each film, Jaws: The Revenge was made in less than nine months. According to associate producer and production manager Frank Baur during the sequel's filming, "This (Revenge) will be the fastest I have ever seen a major film planned and executed in all of my 35 years as a production manager." The film was nominated for seven Golden Raspberry Awards, and won one. On Amity Island, Martin Brody, famous for his role as Police Chief and his heroism during the previous events, has recently died from a heart attack. His wife, Ellen, attributes it to the fear of sharks. She now lives with Brody's younger son, Sean, and his fiancée, Tiffany. Sean now works as a police deputy, and is dispatched to clear a log from a buoy a few days before Christmas. A great white shark appears and kills him, sinking his boat in the process. Brody's older son Michael, his wife Carla, and their five-year-old daughter, Thea, come to Amity for the funeral, and encourage Ellen to come from Massachusetts to the Bahamas with them. At the islands, Ellen meets carefree airplane pilot Hoagie. Michael, along with partners Jake, William, and Clarence, works as a marine biologist studying conch. Unbeknownst to them, the same shark that killed Sean follows them to the Bahamas. A few days later, Michael, Jake, and their crew encounter the shark. Jake is eager to do research on the shark, because great white sharks hardly come to the Bahamas as the water there is warm, and sharks are misunderstood creatures, but Michael asks him not to mention the shark due to Ellen's attempts to convince him to find a job on land. Ellen becomes so obsessive that she begins having nightmares and premonitions of being attacked by a shark. Then, she starts getting psychic feelings when the shark is near or attacks. She and the shark have a strange connection that is unexplained. Jake decides to attach a device to the shark that can track it through its heartbeat. Using chum to attract it, Jake stabs the device's tracking pole into the shark's side. The next day, the shark chases Michael through a sunken ship, and he narrowly escapes. Thea goes on an inflatable banana boat with her friend Margaret and her mother, while Carla presents her new art sculpture. The shark goes for Thea, but attacks and kills Margaret's mother instead. Ellen boards Jake's boat to track down the shark, intending to kill it to save the rest of her family. After hearing about what happened, Michael confesses about the shark, infuriating Carla. Michael and Jake are flown by Hoagie to search for Ellen, and they find the shark in pursuit of their boat. During the search, Hoagie explains to Michael about Ellen's belief that the shark that killed Sean is after her family. When they find her, Hoagie lands the plane on the water, ordering Michael and Jake to swim to the boat as the shark drags the plane and Hoagie underwater. Fortunately, Hoagie escapes from the shark. Jake and Michael hastily put together an explosive, powered by electrical impulses. As Jake moves to the front of the boat, the shark lunges, giving it the chance to pull Jake under and maul him alive. He manages to get the explosive into the shark's mouth before he is taken underwater. Michael begins blasting the shark with the impulses, which begin to drive it mad; it repeatedly jumps out of the water, roaring in pain. Michael continues to blast the shark with the impulses, causing it to leap out of the water again, igniting the bomb as Ellen steers the sailboat towards the shark while thinking back to Sean's demise, the shark's attack on Thea, and when her husband defeated the first shark. The broken bowsprit impales the shark in the exact spot where the bomb is, causing it to explode on impact. The shark's corpse then sinks to the bottom of the sea. Michael then hears Jake calling for help, seriously injured, but alive and conscious, floating in the water. The three survive the deciding encounter, and safely make it back to land. Hoagie then flies Ellen back to Amity Island. Joseph Sargent produced and directed the film. He had worked with Lorraine Gary in 1973's The Marcus-Nelson Murders, for which he won his first Directors Guild of America Award. Indeed, Steven Spielberg cites this television film, which later spawned Kojak, as motivation for casting Gary as Ellen Brody in the original Jaws film, besides the fact she was the wife of the studio's chief executive Sidney Sheinberg at that time. In regards to Revenge, Gary remarked in an interview: "I made a good deal on this film, but I didn't make as good a deal as I would have if I weren't married to Sid." Principal photography for Jaws: The Revenge took place on location in New England and in the Bahamas, and completed on the Universal lot. Like the first two films of the series, Martha's Vineyard was the location of the fictional Amity Island for the film's opening scenes. Production commenced on February 2, 1987, by which time "snowstorms had blanketed" the island for almost a month, "providing a frosty backdrop for the opening scenes." 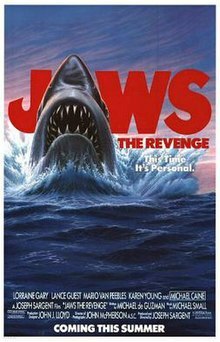 Because the sequel had to be ready for release by July of the same year and the mechanical shark had to be filmed in warmer temperatures, Martha's Vineyard only makes a cameo appearance in Revenge. In addition to the 124 cast and crew members, 250 local extras were also hired. The majority of the extras were used as members of the local high school band, chorus and dramatic society that can be seen as the Brodys walk through the town, and during Sean's attack. A local gravestone maker produced 51 slabs for the mock graveyard used for Sean's funeral. The cast and crew moved to Nassau in the Bahamas on February 9, beginning principal photography there the next day. Like the production of the first two films, they encountered many problems with varying weather conditions. The location did not offer the "perfect world" that the 38-day shoot required. Cover shots were filmed on shore and in interior sets. The film was shot in the Super 35 format. A frame from the sequence where the shark is destroyed, showing the crude shark model. Henry Millar was awarded for "Worst Visual Effects" at the 1987 Golden Raspberry Awards. The special effects team, headed by Henry Millar, had arrived at South Beach, Nassau on January 12, 1987, almost a month before principal photography commenced there. In the official press release, Millar says that when he became involved "we didn't even have a script ... but as the story developed and they started telling us all what they wanted ... I knew this wasn't going to be like any other shark anyone had ever seen." The shark was to be launched from atop an 88-foot (27 m) long platform, made from the trussed turret of a 30-foot (9.1 m) crane, and floated out into Clifton Bay. Seven sharks, or segments, were produced. Two models were fully articulated, two were made for jumping, one for ramming, one was a half shark (the top half) and one was just a fin. The two fully articulated models each had 22 sectioned ribs and movable jaws covered by a flexible water-based latex skin, measured 25 feet (7.6 m) in length and weighed 2500 pounds. Each tooth was half-a-foot long and as sharp as it looked. All models were housed under cover ... in a secret location on the island. The film company returned to Universal to finish shooting on April 2. Principal photography was completed in Los Angeles on May 26. Millar's special effects team, however, remained in Nassau, completing second unit photography on June 4. Cinematographer John McPherson also supervised the underwater unit, which was headed by Pete Romano. Whereas underwater photography was normally filmed with an anamorphic lens, requiring overhead lighting, Romano filmed these "sequences with Zeiss, a 35 mm super-speed lens, which allows the natural ambiance to come through on film." Additional underwater photography was completed in a water tank, measuring 50 feet (15 m) by 100 feet (30 m) across, and 17 feet (5.2 m) in depth, in Universal Studio's Stage 27. Also, a replica of Nassau's Clifton Bay and its skyline was created on the man-made Falls Lake on the studio backlot. A television documentary, "Behind the Scenes with Jaws: The Revenge", was broadcast in the U.S. on July 10, 1987. Twenty-two minutes in length, it was written and directed by William Rus for Zaloom Mayfield Productions. In the ending that was in the original theatrical version, Ellen rammed the shark with Mike's boat, mortally wounding it. The shark then causes the boat to break apart with its death contortions, forcing the people on the boat to jump off to avoid going down with it. American audiences disapproved of this ending. A new ending was ordered shot for foreign distribution with the shark getting stabbed with the bow sprit and then exploding; and with Jake being found wounded but alive. This version is what Universal used on home media releases. According to Orange Coast, the magazine of Orange County, re-shooting the ending prevented Michael Caine from collecting his Academy Award for Hannah and Her Sisters in person. Other sources claim that the reshot ending began filming only five days after the movie was released and was intended for the version released in Europe. One version can be seen on cable broadcasts, while the other version is featured on the home releases. The ending left many filmgoers confused. In his scathing review of the film, Roger Ebert says that he cannot believe "that the director, Joseph Sargent, would film this final climactic scene so incompetently that there is not even an establishing shot, so we have to figure out what happened on the basis of empirical evidence." In its predecessor, Mike is an engineer for SeaWorld, whereas in Jaws: The Revenge he is a marine research scientist. One of the Universal press releases for Jaws: The Revenge refers to Jaws: The Revenge as the "third film of the remarkable Jaws trilogy." The underwater chase scene between Mike and the shark in Revenge was lifted from an early screenplay draft of Jaws 3-D.
Lorraine Gary portrayed Ellen Brody in the first two films. In a press release, Gary says Jaws: The Revenge' is "also about relationships which ... makes it much more like the first Jaws." This was Gary's first film since appearing in Spielberg's 1941 eight years earlier, as well as her final film role. The press release proposes that the character "had much more depth and texture than either of the other films was able to explore. The promise of further developing this multi-dimensional woman under the extraordinary circumstances ... intrigued Gary enough to lure her back to the screen after a lengthy hiatus." Although the film was always going to be centered on Gary, Roy Scheider was offered a cameo. If he had accepted it, it was his Martin Brody character, rather than Sean Brody, who would have been killed by the shark at the film's beginning. Gary is the only principal cast member from the original film who returned, although Lee Fierro made a brief cameo as Mrs. Kintner (the mother of a boy killed in Jaws), as did Fritzi Jane Courtney, who played Mrs. Taft, one of the Amity town council members in both Jaws and Jaws 2. Cyprian R. Dube, who played Amity Selectman Mr. Posner in both Jaws and Jaws 2, is upgraded to mayor following the death of Murray Hamilton, who played Larry Vaughan, the mayor in the first two Jaws films. Gary states that one of the reasons she was attracted to the film was the idea of an on-screen romance with Oscar winner Michael Caine. Caine had previously starred in another Peter Benchley-adapted flop, The Island. The first day we were to work together I was nervous as a school girl. We were shooting a Junkanoo Festival with noisy drums and hundreds of extras. But he never faltered in his concentration and he put me completely at ease. It was all so natural. He's an extraordinary actor – and just a nice human being. Caine had mixed feelings about both the production and the final version. He thinks that it was a first for him to be involved with someone his own age in a film. He compares the relationship between two middle-aged people to the romance between two teenagers. Although disappointed not to be able to collect an Academy Award because of filming in the Bahamas, he was glad to be involved in the film. In the press release, he explains that "it is part of movie history ... the original was one of the great all-time thrillers. I thought it might be nice to be mixed up with that. I liked the script very much." However, Caine later claimed: "I have never seen it [the film], but by all accounts it is terrible. However, I have seen the house that it built, and it is terrific!" In his 1992 autobiography What's it All About?, he says that the film "will go down in my memory as the time when I won an Oscar, paid for a house and had a great holiday. Not bad for a flop movie." Lance Guest played Ellen's eldest son Mike. Guest had dropped out of his sophomore year at UCLA (1981) to appear in another sequel to a horror classic; Halloween II. Karen Young played his wife Carla. She commended the director's emphasis upon characterization. Mario Van Peebles played Jake, Michael's colleague. His father, Melvin Van Peebles, has a cameo in the film as Nassau's mayor. Mitchell Anderson appeared as Ellen's youngest son, Sean. Lynn Whitfield played Louisa, and stunt performer Diane Hetfield was the victim of the banana boat attack. The score was composed and conducted by Michael Small, who had previously provided music for Klute, Marathon Man (both of which featured Jaws star Roy Scheider) and The Parallax View. John Williams' original shark motif is integrated into the score, although Small removed the Orca theme. Soundtrack.net says that "Small's score is generally tense, and he comes up with a few new themes of his own." The film also contained the songs "Nail it to the Wall", performed by Stacy Lattisaw, and the 1986 hit "You Got It All", performed by The Jets. Unlike the preceding entries in the series, the soundtrack was not released at the same time as the film, although Small appears to have mixed tracks for a release. However, it was given a promotional release in 2000 on Audio CD and Compact Cassette. Reviews for the soundtrack album were more favorable than for the film. Indeed, writing for Film Score Monthly, AK Benjamin says that "on a CD, Small's material fares better since it's not accompanied by the film." Dismissing the film as "engagingly unwatchable", he says that "Small certainly gave Revenge a lot more than it deserved – and this a much better score than Deep Blue Sea ... whatever that means." Benjamin portrays Small as 'knowing' and his work as being superior to the film. The hysterical coda tacked onto the end of "Revenge and Finale" is almost worth the price of the disc, as it no doubt sums up Small's opinion of the film. It's sad that the great Michael Small was delegated utter crap like Jaws the Revenge in the late '80s – and even worse that he never found his way back to the material that he deserves. Upon Small's death in 2003, The Independent wrote that the "composer of some distinction ... had the indignity of working on one of the worst films of all time". Like most reviews of the soundtrack, the article criticizes the film whilst saying "Small produced a fine score in the circumstances, as if anyone noticed." In 2015, Intrada Records, which previously reissued Jaws 3-D on compact disc, released the complete score. The novelization was written by Hank Searls, who also adapted Jaws 2. 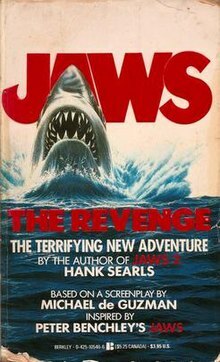 While Searls' Jaws 2 novelization was based on an earlier draft of that film and was significantly different from the finished film, his Jaws: The Revenge novelization sticks fairly close to the final film, although it does contain some extra subplots. The novel contains a subplot in which Hoagie is a government agent and he transports laundered money. The only reference to this in the film is when Michael Brody asks "What do you do when you're not flying people?" to which Hoagie replies, "I deliver laundry." In Searls' novel, the character of Jake is ultimately killed by the shark; Jake was originally supposed to die in the film, but the script was changed to allow him to survive. The novelization suggests that the shark may be acting under the influence of a vengeful voodoo witch doctor (who has a feud with the Brody family), and the shark's apparent revenge has magical implications. Therefore, the witch doctor is the 'revenge' and the shark is his tool. This also explains the strange psychic connection Ellen and the shark have with each other. The plot was deleted as it strayed too far away from the plot of the killer shark. However, at one point in the theatrical version, Michael Brody says, "Come on, sharks don't commit murder. Tell me you don't believe in that voodoo." Searls' novelization presents a continuity that combines elements from Peter Benchley's Jaws novel as well as the Jaws film series. The novelization makes a reference to Ellen Brody's affair with Matt Hooper, a subplot that exists in Benchley's novel but is entirely absent from the film adaptation. Jaws: The Revenge received negative reviews from critics and to this day, remains one of the few films to hold a 0% score on Rotten Tomatoes based on 34 reviews with an average rating of 2/10. The critical consensus reads, "Illogical, tension-free and filled with cut-rate special effects, Jaws 4 - The Revenge is a sorry chapter in a once-proud franchise." Gary did get nominated for a Saturn Award for Best Actress for her performance, but also a Golden Raspberry Award for Worst Actress where she lost both awards to Jessica Tandy for Batteries Not Included and Madonna for Who's That's Girl respectively. It was rated by Entertainment Weekly as one of "The 25 Worst Sequels Ever Made". It was voted number 22 by readers of Empire magazine in their list of The 50 Worst Movies Ever. Roger Ebert of the Chicago Sun-Times gave the film zero stars, writing in his review that it "is not simply a bad movie, but also a stupid and incompetent one." He lists several elements that he finds unbelievable, including that Ellen is "haunted by flashbacks to events where she was not present." Ebert joked that Caine could not attend the ceremony to accept his Academy Award for Best Supporting Actor earned for Hannah and Her Sisters because of his shooting commitments on this film, because he may not have wanted to return to the shoot if he had left it. Many scenes are considered implausible, such as the shark swimming from a Massachusetts island to the Bahamas (approx. 1,193 miles) in less than three days, somehow knowing that the Brody family went to the Bahamas or following Michael through an underwater labyrinth, as well as the implication of such a creature seeking revenge. The Independent pointed out that "the film was riddled with inconsistencies [and] errors (sharks cannot float or roar like lions)". The special effects were criticized, especially some frames of the shark being speared by the boat's prow, and the mechanisms propelling the shark can be plainly seen in some shots. Derek Winnert ends his otherwise lukewarm review with "the Bahamas backdrops are pretty and the shark looks as toothsome as ever." Richard Scheib also praises the "beautiful above and below water photography" and the "realistic mechanical shark," although he considers "the melodrama back on dry land ... a bore." Critics commented upon the sepia-toned flashbacks to the first film. A scene with Michael and Thea imitating each other is interspersed with shots from a similar scene in Jaws of Sean (Jay Mello) and Martin Brody. Similarly, the shark's destruction contains footage of Martin Brody aiming at the compressed air tank, saying "Smile, you son of a ... ," The New York Times comments "nothing kills a sequel faster than reverence ... Joseph Sargent, the director, has turned this into a color-by-numbers version of Steven Spielberg's original Jaws." Michael Caine questioned about the film stated, "I have never seen it, but by all accounts it is terrible. However, I have seen the house that it built, and it is terrific." The increasing number of sequels in the Jaws series was spoofed in the 1989 film Back to the Future Part II (which was produced by Steven Spielberg and featured Jaws 3 star Lea Thompson), when Marty McFly travels to the year 2015 and sees a theater showing Jaws 19, (fictionally directed by Max Spielberg) with the tagline "This time it's REALLY REALLY personal!". This alludes to the tagline of Jaws: The Revenge: "This time it's personal." After being "attacked" by a promotional volumetric image of the shark outside the theatre, Marty says "the shark still looks fake." In celebration of "Back to the Future Day" in 2015, Universal released a parody trailer for Jaws 19, where the sequels after The Revenge would have included sharks in various environments, prequels, and even a love story titled Jaws 17: Fifty Scales of Grey. The film is listed in Golden Raspberry Award founder John Wilson's book The Official Razzie Movie Guide as one of The 100 Most Enjoyably Bad Movies Ever Made. Jaws: The Revenge was the first film of the series to be released on DVD. It was released on Region 1 as a 'vanilla' disc by Goodtimes, featuring Spanish and French subtitles. The feature is presented in a non-anamorphic 2.35:1 widescreen transfer. The soundtrack was presented in Dolby Digital 4.1, with one reviewer saying that the "stereo separation is great with ocean waves swirling around you, the bubbles going by during the scuba scenes, and Hoagie's airplane flying around behind you." The same reviewer praised the image transfer of McPherson's "extremely well photographed" cinematography. The film was re-released on DVD by Universal on June 3, 2003 in an anamorphic transfer. In 2015, Jaws: The Revenge was re-released on DVD as part of a three movie multi-pack, along with Jaws 2 and Jaws 3-D.
Universal Studios Home Entertainment released Jaws: The Revenge on Blu-ray on June 14, 2016. The bonus features on the disc are the film's theatrical trailer and the original theatrical ending. ^ "JAWS - THE REVENGE (PG)". British Board of Film Classification. August 6, 1987. Retrieved June 7, 2015. ^ "Jaws 4 (1987)". The Numbers. Retrieved June 7, 2015. ^ "Jaws 4: The Revenge (1987)". Box Office Mojo. Retrieved April 23, 2017. ^ a b "'Jaws Revenge' - more summer fun", by Donna Rosenthal. Boston Herald, March 28, 1987. Pg. 31. ^ "Joseph Sargent "Jaws The Revenge" Universal News" (Press release). Universal Studios. 1987. ^ "The Shark That Won't Go Away", by Donna Rosenthal. Newsday, March 22, 1987. ^ Rutkowski, Gary (March 9, 2006). Joseph Sargent Interview. Archive of American Television. ^ a b c d e f g ""Jaws The Revenge": Production Notes, Universal News" (Press release). Universal Studios. 1987. ^ "Jaws: The Revenge". Allmovie. Retrieved 2007-05-31. ^ "Behind the Scenes with 'Jaws: The Revenge'". Internet Movie Database. Retrieved 2007-05-31. ^ a b c d Begg, Ken. "Jaws: The Revenge – Jabootu's Bad Movie Dimension". Archived from the original on September 21, 2006. Retrieved 2006-09-20. ^ a b Weinberg, Mark (October 1993). "Surprise Endings". Orange Coast. Emmis Communications. 19 (10): 119. ISSN 0279-0483. ^ "Toledo Blade - Google News Archive Search". news.google.com. Retrieved December 23, 2017. ^ a b Ebert, Roger. "Jaws the Revenge". Chicago Sun-Times. Retrieved 2006-09-18. ^ a b "Karen Young "Jaws The Revenge" Universal News" (Press release). Universal Studios. 1987. ^ a b "Lorraine Gary "Jaws The Revenge" Universal News" (Press release). Universal Studios. 1987. ^ "Michael Caine "Jaws The Revenge" Universal News" (Press release). Universal Studios. 1987. ^ "Jaws: The Revenge". anecdotage.com. Archived from the original on October 6, 2007. Retrieved 2007-06-01. ^ Caine, Michael (1992). What's it All About. Century. p. 445. ISBN 0-7126-3567-X. ^ "Lance Guest "Jaws The Revenge" Universal News" (Press release). Universal Studios. 1987. ^ "Mario Van Peebles "Jaws The Revenge" Universal News" (Press release). Universal Studios. 1987. ^ "Michael Small (I)". Internet Movie Database. Retrieved 2007-06-01. ^ Goldwasser, Dan (2000-06-29). "Jaws: The Revenge Promotional Release (MSML 1001)". Retrieved 2007-06-01. ^ "You Got It All by The Jets". songfacts.com. Retrieved 2007-06-01. ^ a b Benjamin, AK (2000-09-25). "Jaws: The Revenge ***". Retrieved 2007-06-01. ^ a b Leigh, Spencer (9 January 2004). "Michael Small – Prolific film composer". The Independent. Retrieved 2009-09-19. ^ "Hank Searls Writers Workshops". Retrieved 2007-02-11. ^ "The 25 Worst Sequels Ever Made – 10. Jaws: The Revenge (1987)". Entertainment Weekly. Retrieved 2008-02-26. ^ "The 50 Worst Movies Ever". empireonline.com. Retrieved 23 July 2012. ^ Winnert, Derek (1993). Radio Times Film & Video Guide 1994. London: Hodder & Stoughton. p. 546. ISBN 0-340-57477-1. ^ Scheib, Richard. "JAWS: THE REVENGE". Moria: Science Fiction, Horror and Fantasy Film Review. Retrieved 2012-04-05. ^ James, Caryn (1987-07-18). "Film: 'Jaws the Revenge,' The Fourth in the Series". The New York Times. Retrieved 2007-06-01. ^ Collin, Robbie (March 14, 2003). "Michael Caine: Extraordinarily good and spectacularly awful". The Daily Telegraph. Retrieved January 7, 2018. ^ Field, Matthew (October 30, 2014). Michael Caine: You're a Big Man. Pavilion Books. p. 257. ISBN 9781849942515. ^ Collin, Robbie (March 14, 2013). "Michael Caine: Extraordinarily good and spectacularly awful". Retrieved December 23, 2017 – via www.telegraph.co.uk. ^ Leeds, Sarlene (October 6, 2015). "'Jaws 19': Universal Releases Trailer for Fake Movie in 'Back to the Future Part II'". The Wall Street Journal. Retrieved November 2, 2015. ^ Messenger, Neil. "JAWS THE REVENGE". dvdcult.com. Archived from the original on 2006-09-26. Retrieved 2007-06-01. ^ "Universal: Jaws 2 and 3 and Jaws the Revenge coming to Blu-ray". Blu-ray.com. Retrieved 2016-04-08. This page was last edited on 17 April 2019, at 02:13 (UTC).